Augsburg, 18 April 2018 – The aerostructures supplier Premium AEROTEC reinforces its leading position in the additive manufacturing sector by taking over APWORKS, the 3D print specialist. Both partners complement the other’s capabilities and aim to profit from the fast-paced growth in the 3D printing market together. Premium AEROTEC and Airbus, the previous owner of APWORKS, have agreed to keep the purchasing price confidential. Premium AEROTEC is a pioneer in implementing metal 3D printing for aviation. The company is the first aviation supplier that was able to introduce 3D printed titanium components into the structure of aircraft. Premium AEROTEC has full capability throughout the entire additive manufacturing process chain, from product conception to development and the actual printing process through to the downstream process steps, right up until the qualified parts are handed over to the client. APWORKS was founded as an Airbus Group spin-off in 2013 and has since positioned itself as a technology driver for manufacturing methods for the future, with a clear focus on metal additive manufacturing. The company’s strengths lie in its fast-paced, client-oriented and highly qualitative solution finding throughout the entire value added chain for additive manufacturing and its links to a great many industries. 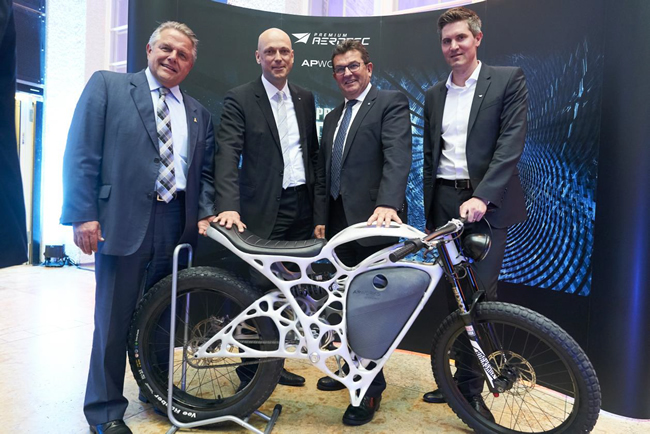 “With Premium AEROTEC coming on board, we can take a huge step closer to our vision of industrial mass production using additive manufacturing technology”, said Joachim Zettler, Managing Director of APWORKS. “The aim is to combine APWORKS’ highly dynamic approach in solving the issues posed by our clients’ additive manufacturing questions with Premium AEROTEC’s decades of production experience to elicit maximum benefit for our clients from each and every industry, throughout the entire additive manufacturing value added chain”. APWORKS’ objective is to support its clients in advancing in additive manufacturing-related areas. Here, the team can rely on experience from a broad client base: APWORKS’ expertise is comprised of identifying application fields suitable for 3D printing, optimization in line with 3D design guidelines and a unique understanding of materials. APWORKS produces components as prototypes and in mass using its own machinery. The company uses this to serve a clientele which harks from a wide variety of industry sectors and simultaneously uses it to pave the way for their industrial production of components manufactured via additive manufacturing. Joining forces of Premium AEROTEC and APWORKS gives clients access to currently eleven production units, which use a wide variety of materials, and the entire value-added chain of component reconditioning. With Premium AEROTEC as the sole shareholder, APWORKS remains an independent company with its own market presence. With its start-up reactivity and mentality, APWORKS helps its clients to identify which components are suitable for 3D printing, to optimize them and to produce them as quickly as possible. Equally, APWORKS can remain focused on its other core areas. These include prototyping, development and distribution of the patented material Scalmalloy®, a high-strength aluminium alloy for additive manufacturing of components, and above all the development of qualified mass production applications. In addition, the development of special software for additive manufacturing continues to take on increasing significance. Premium AEROTEC is a global player in the aerospace industry and generated revenues of 2 billion euros in 2017. The company’s core business lies in the development and production of metal and carbon fibre composite aircraft structures. The company has sites in Augsburg, Bremen, Hamburg, Nordenham and Varel in Germany, as well as in Braşov in Romania. For further information see: www.premium-aerotec.com. APWORKS makes proven aerospace technologies accessible in many different industries. Focusing on metal 3D printing (additive manufacturing) the company covers the entire value chain, from optimized component and part design to the choice of suitable materials, from prototyping to qualified serial production. Customers in robotics, mechanical engineering, automotive, medical technology and aerospace benefit from functionally integrated and optimized parts with reduced weight and lead time. 3D printing also allows much more complex geometries than were previously possible. For further information see: www.apworks.de. This entry was posted in News and tagged 3D printed titanium components, Additive Manufacturing, Airbus, Airbus Group, AM, APWorks, Dr. Thomas Ehm, Joachim Zettler, Premium AEROTEC, Scalmalloy® by AM. Bookmark the permalink.